Figure 4228a shows the schematic illustration of deflectors and condenser lenses above the specimen in TEM. The electron gun consists of a filament and a column where the incident electrons are accelerated. 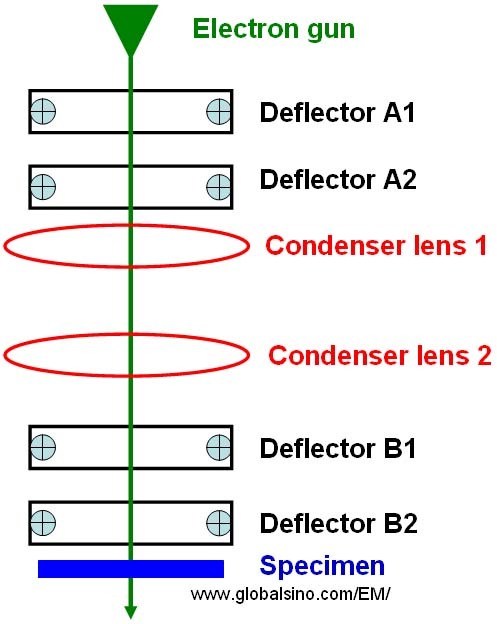 The functions of double deflectors A1 and A2 are gun shift and tilt, while the functions of double deflectors B1 and B2 below the condenser lens 2 and above the specimen are beam shift and tilt as well as tilt for dark field imaging. The beam shift and tilt are also called illumination shift and tilt. Figure 4228a. Schematic illustration of deflectors and condenser lenses above the specimen in TEM. In conventional TEMs, gun alignment is performed at well below saturation (cat's eye) and the X and Y gun controls are used to obtain a symmetrical image as shown in Figure 4228b. Figure 4228b. Gun aligned to a symmetrical image. Figure 4228c shows an example of SEM systems. 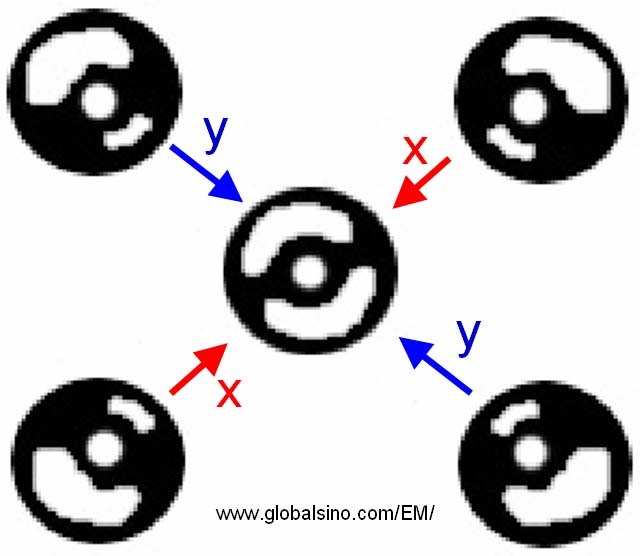 In all EMs (electron microscopes), electrons from the gun do not always pass through the center of the lens system, so that correction is made by controlling the gun-alignment coil with a gun-alignment coil control system. Figure 4228c. Example of computer-controlled EMs: SEM system. i) Select the BRIT TILT button on the panel. ii) Press the ANODE WOBBLER button. iii) Use the TILT knobs on the panel to make the beam expand and contract concentrically.